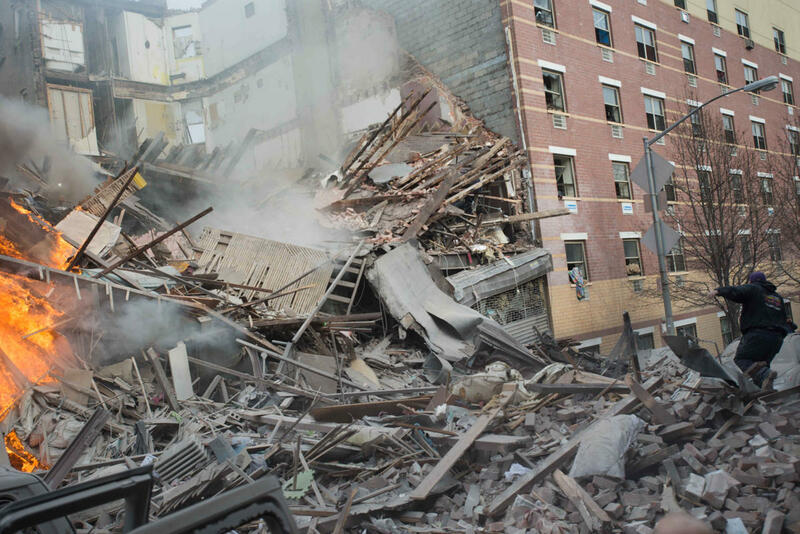 JNN 14 Mar 2014 New York : A gas leak triggered an earthshaking explosion that flattened two apartment buildings on Wednesday, killing at least six people and injuring more than 60. A tenant said residents had complained repeatedly in recent weeks about “unbearable” gas smells. Rescue workers began the search for victims Wednesday evening amid the broken bricks, splintered wood and mangled metal after firefighters spent most of the day dousing the flames. Heavy equipment, including back hoes and a bulldozer, arrived to clear the mountain of debris where the two five-story East Harlem buildings stood. Flood lights were put in place. Thermal imaging cameras were used to identify heat spots — bodies or pockets of fire. Just after the explosion, nine residents were said to be missing, but as the number of dead increased the number of unaccounted for occupants dropped. The fiery blast, on Park Avenue at 116th Street, not far from the edge of Central Park, erupted about 9:30 a.m., around 15 minutes after a neighboring resident reported smelling gas, authorities said. The Con Edison utility said it immediately sent workers to check out the report, but they didn’t arrive until it was too late. Emanuel Rivera, 24, lives on the corner of 116th and Park Avenue, across the street from the blast site. He was at home sleeping with his wife Rehanna and their two children when it happened. “All you heard was boom. The whole building shook. We looked outside and there was a bunch of smoke. Everything was in flames,” he said. Like several other neighbors, Rivera said they started smelling gas Tuesday night. “The smell of gas was there since yesterday night,” he said. Hunter College identified one of the people killed in the blast as Griselde Camacho, a security officer who worked at the Silberman School of Social Work building. Hunter, in a statement on its website, said Camacho, 45, had worked for the college since 2008. Another of the people who died was Carmen Tanco, 67, a dental hygienist. Her cousin News 12 cameraman Angel Vargas said when she didn’t show up for work Wednesday the family started a frantic search. Police identified the third fatal victim as Rosaura Hernandez-Barrios, 21. The bodies of three unidentified people also were found: an adult male pulled from the rubble just after midnight Wednesday; a woman found about 2:50 a.m. Thursday; and a man discovered about a half hour later. At least three of the injured were children; one, a 15-year-old boy, was reported in critical condition with burns, broken bones and internal injuries. Most of the other victims’ injuries were minor and included cuts and scrapes. Fire officials said some people were unaccounted for but cautioned they may not have been in the buildings. Jennifer Salas lived in one of the buildings. She told The New York Times her husband, Jordy Salas, and her dog were in the building at the time of the collapse and were missing. Edward Foppiano, a Con Ed senior vice president, said there was only one gas odor complaint on record with the utility from either address, and it was last May, at the building next door to Borrero’s. It was a small leak in customer piping and was fixed, he said. City building records don’t show any work in progress at either address, but the building owned by the Spanish Christian Church had obtained permits and installed 120 feet of gas pipe last June. “Age is not in and of itself an issue with cast iron,” he said, noting that Con Edison has a cast iron replacement program and the pipe was not slated to be removed in the next three-year period. Just before the explosion, a resident from a building next to the two that were destroyed reported smelling gas inside his apartment and thought the odor might be coming from outside, Con Ed spokesman Bob McGee said. Con Ed dispatched two crews two minutes after the 9:15 a.m. call came in, McGee said. But they didn’t get there in time. The tragedy brought the neighborhood to a standstill as police set up barricades to keep residents away. Thick, acrid smoke made people’s eyes water. Some people wore surgical masks, while others held their hands or scarves over their faces. Witnesses said the blast was so powerful it knocked groceries off store shelves. The Metro-North Railroad, which serves 280,000 riders a day in New York and Connecticut, suspended service to and from Grand Central Terminal, one of the nation’s busiest commuter hubs, for much of the day while the debris was removed from its tracks, the structural integrity of the elevated structure was checked and test trains were run past the explosion site to see if vibrations would endanger the rescue effort. Service resumed late in the afternoon. A resident of the one of the buildings, Eusebio Perez, heard news of the explosion and hurried back from his job as a piano technician. A Red Cross center was set up at a public school, where about 50 people had gathered, including some who were searching for loved ones. The explosion destroyed everything Borrero’s family owned, including the ashes of his father, who died a few years ago. Borrero said he assumes his 5-year-old terrier, Nina, was killed. This entry was posted in America, Middle East, Pakistan News and tagged Con Ed, Con Edison, Emanuel Rivera, Explosion, Griselde Camacho, Harlem, Kaoru Muramatsu, New York, NY, Ruben Borrero. Bookmark the permalink.